Greetings in the name of our Lord and Savior Jesus Christ. We welcome you, your family and friends to come visit us during our Morning Worship Service, Sunday, 10:45 AM. From the Southside -Take 9A crossing the Dames Point Bridge to Dunn Ave exit going right. The church will be approximately 1 mile on the left. From the Westside - Take I295 North to Dunn Ave exit going left. The church will be approximately 1 mile on the left. From anywhere - I95 to I295 to Dunn Ave to Emmanuel. We are excited about seeing you at The Big E!! The majority of the members of Emmanuel C.O.G.I.C. have been worshipping together since the mid 1970s where we were members of Holy Temple C.O.G.I.C. on 5th and Woods, here in Jacksonville Florida under the leadership of the late Bishop C.D. Kinsey. The Church grew and moved to a large building on Edgewood Ave in 1975 – 1976 time frame. The new building / Church was named Greater Holy Temple C.O.G.I.C. It was in 1975 that Elder Gabriel Hall joined the fellowship of Greater Holy Temple. After serving for some years in many capacities of this fellowship, Elder Hall was appointed as Assistant Pastor to the late Bishop C.D. Kinsey. The Church continued to grow and soon moved to Beaver Street in the mid to late 1980s time frame and was named Cathedral of Faith C.O.G.I.C. In 2001, Elder Hall assumed the Assistant Pastor role in full due to the Hospitalization of Bishop Kinsey. Elder Hall pastured the flock for a little more than 18 months. In January 2003, Bishop C.D. Kinsey passed away. The decision to branch out and start anew was made by Elder Hall. March 30, 2003, was the first Service held for Emmanuel C.O.G.I.C, at a small wedding chapel in the Arlington area of Jacksonville. More than 80 people attended the service and 36 members who fellowshipped together, some since the mid 1970’s were first members to become a part of the newly formed Emmanuel Church Of God In Christ of Jacksonville. January 2004, The Church body and Pastor Hall was officially Consecrated and Installed by the Church of God In Christ Organization. February 2005 we purchased land to build a sanctuary. In March 2005 Pastor Hall formed the Building Committee to help with the ins and outs of building. The decision was made to start with the Multi-purpose building and use it as the sanctuary until the church builds the main sanctuary. 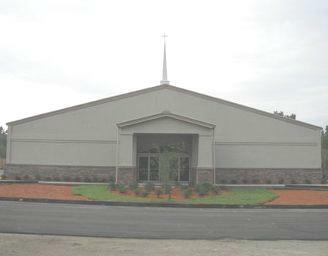 The Emmanuel Multi-purpose building was completed in late October 2008 and the Emmanuel Church family had our first service in our brand new building at 6326 Dunn Avenue, Jacksonville, Florida on Thanksgiving day, November 28, 2008.